For all the reverential bows in its direction, pacifism has had a rough ride in the cinema. Cruelty and violence weather the years far better, for even their most fantastic incarnations seem closer to the reality of our cruel and violent times. “Cruelty was on the ‘good side’”, says Serge Daney. “It was cruelty that said no to academic ‘illustration’ and destroyed the hypocritical feelings of a wordy humanism” (1). Haunted by the shadow of naiveté, even uselessness, the aesthetic qualities of the pacifist cinema often suffered apace with its evident futility in the face of real-life horrors. La Grande Illusion (1937) alone, perhaps, exists to this day with its artistic reputation intact, while a film such as Lewis Milestone’s All Quiet on the Western Front (1930) is little more than an essential but stodgy footnote in film history, sinking in the seas of critical regard with its League of Nations peace medal clutched in hand. Much the same has happened to the second winner of that patently ironic decoration, G.W. Pabst’s Kameradschaft. Drawing inspiration from the Courrières mine disaster of 1906, during which German miners violated the border to rescue their trapped French counterparts, Pabst updated the event to the post-war period and relocated it in Lorraine, one of the sorest and most hotly disputed regions on the Franco-German border. The symbolism was transparent, and thus effective. Kameradschaft received the requisite acclaim for a humanitarian film by a major director, was awarded that fateful medal – and quickly passed into irrelevance as the National Socialists seized control of the Reichstag in 1932 and went about heightening (if such a mild word can suffice) those very divisions which Pabst had hoped might be eradicated. Undoubtedly, the maker of a pacifist film bears a profound responsibility – not to ensure that world events conform to his ideals, but that his artistry holds fast to the truths which give those ideals relevance. Pabst can certainly be faulted for not pressing far enough into perhaps the most crucial issue of his scenario: in this film about proletarian solidarity there is hardly a mention of class conflict, as if Pabst were unwilling to sully his paean to international brotherhood with the dirty facts of economic exploitation. This hesitancy adds something of a hollow ring to the otherwise moving speech at the film’s end, when the French orator decries “our two enemies: Gas and War!” – with not a hint as to what birthed those enemies, with hardly an accusing finger pointed towards the seats of power. 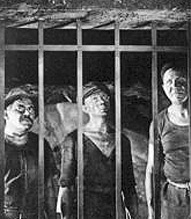 The dilution continues with the oft-excised final scene of French and German officials resealing the underground frontier which the German miners had broken through to aid in the rescue, Pabst’s dark irony sapped of its power by the film’s preceding circumspection. Like Antonioni’s in Red Desert (1964), Pabst’s striking visual treatment of the industrial landscape is his means of exploring how human beings inhabit these spaces, how they have adapted to the strange new environments they have constructed for themselves. By marshaling his masterful command of his medium to recreate the physical and mechanical environment of his tale, Pabst heightens the human element within that environment – he roots his parable in the rhythms and processes of proletarian life, as and how it is lived. The gliding, near-weightless freedom of Pabst’s camera both above- and below-ground employs absolute precision to evoke a breathtaking spontaneity; here, Godard’s famous dictum about tracking shots constituting a moral issue comes down on the side of the just. The workings of the mine, captured in subtly sweeping movements; the terrifying explosion which sends the black-faced miners running in terror towards the camera, traveling backwards to reveal intersecting tunnels and streams of fleeing men; the shots from a moving train as the town’s populace start running en masse towards the works, crowds flowing out of shops and restaurants and into the streets; tracking past the mine’s main gate, behind which desperate women grasp the bars and cry to be let in; perhaps most spectacularly, the blockhouse of the German miners, where pulleys ascend to the cavernous ceiling bearing laundered work clothes and the camera cranes down to move through the massive communal showers. Rather than simply relying on the airtight perfection of his scenario or the set-piece mentality of the Soviet directors, Pabst transforms his parable into a series of mini-epiphanies, the essence of each moment brought forth in full illumination before receding to rejoin the greater stream. Even when Pabst feels the need to italicise, such as the zoom into close-up of the handshake between a French and German rescuer as their squads meet in the mine, the inherent power of the moment surpasses the unfortunate presentation: anonymous behind their gas-masks, the “cubist men” of World War I here join in the preservation of life rather than its destruction. Like his film, Pabst himself fell victim to poor timing. After leaving Germany for France and then the United States in 1933, he later returned to Austria citing family reasons; when war again broke out, he found himself unable to leave and compelled to make films for the Nazi studios in order to keep working. He would never again attain his former peak of success, and his reputation would always remain tarnished by his wartime collaboration, whatever the circumstances may have been. Kameradschaft would be Pabst’s last great achievement, but its explicit social concern and fervent optimism would distance it from the purely aesthetic refuge of his films with Louise Brooks, or the cultural benchmark of his collaboration with Brecht on The Threepenny Opera (1931). But inadequate and compromised as it is, Kameradschaft shows Pabst at the height of his powers, and no longer content to hide behind them. “I am through with the social film”, (12) he reportedly said after completing the film, but the erratic social commitment of this erratic filmmaker here yields a pacifist cinema worthy of Renoir. The humanism of Kameradschaft is writ in images rather than words, in faces and bodies and that which surrounds them; not illustration, but the living matter of hope, finding embodiment on the screen at a time when it could secure little place in the world. Serge Daney, “The Tracking Shot in Kapo”, trans. Laurent Kretzschmar, Senses of Cinema 30, January–March 2004. David Thomson, A Biographical Dictionary of Film Andre Deutsch, London, 1995, p. 567. Russell A. Berman, “A Solidarity of Repression”, G.W. Pabst: An Extraterritorial Cinema, Rutgers University Press, New Brunswick, 1990, p. 116. Harry Alan Potamkin, “Pabst and the Social Film” in The Compound Cinema: The Film Writings of Harry Alan Potamkin, Teachers College Press, New York, 1977, p. 414. Robert Warshow, “Re-Viewing the Russian Movies”, The Immediate Experience, Athenaeum, New York, 1975, p. 271. Frederick W. Ott, The Great German Films, Citadel Press, New Jersey, p.119. Herman G. Weinberg, “The Case of Pabst”, Saint Cinema: Writings on the Film 1929–1970, Dover Publications, New York, 1973, p. 20.